Alison Powell at the Wasa Diner was one of the first merchants to select POS-n-go to record transactions and keep her accounts in order. She needed an electronic solution to over-come the mounds of paper stacking up around her office. Powell said of POS-n-go, "Its great, I used to struggle with lots of paper work to send to the bookkeeper, now I just email her the CSV reports." The ease of creating and sending reports to the bookkeeper has saved "10%" on Powell's bookkeeping bills. The Diner features all-day breakfast, speciality burgers and omelettes along with ten flavours of old fashioned milkshakes. She also points out the pizza's are "to die for." 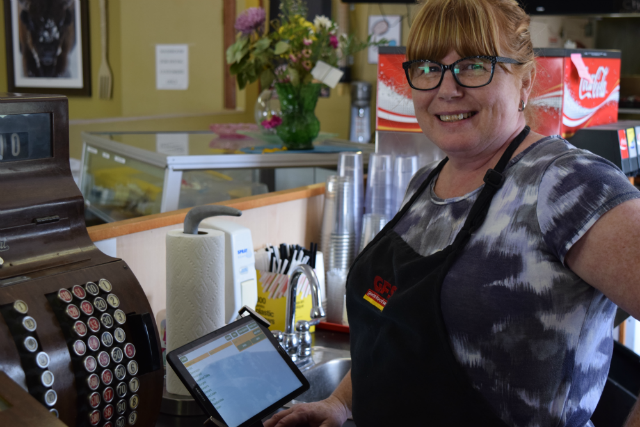 The Wasa Diner still has an old cash register on display, but the POS-n-go tablet sits right beside it doing more than just recording a sales transaction. Located at the corner of Wasa Lake Park Drive and Highway 93/95, the Diner is easy to find and worth the drive for great eats.